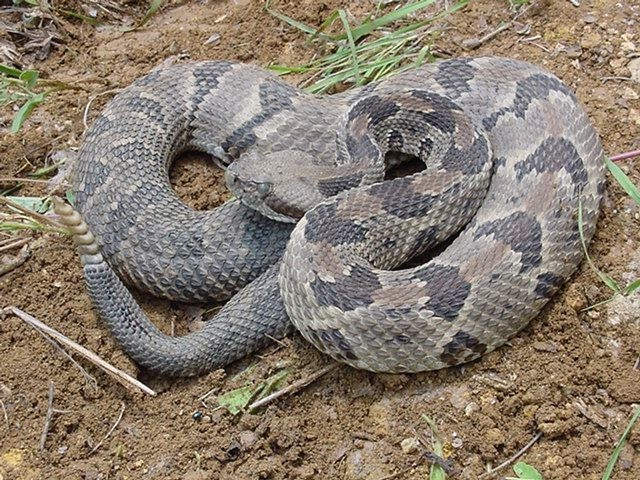 The timber rattlesnake is the most common venomous snake in Kentucky, and also the biggest. This is why people are fascinated about this snake, and urban legends about it appear all the time. 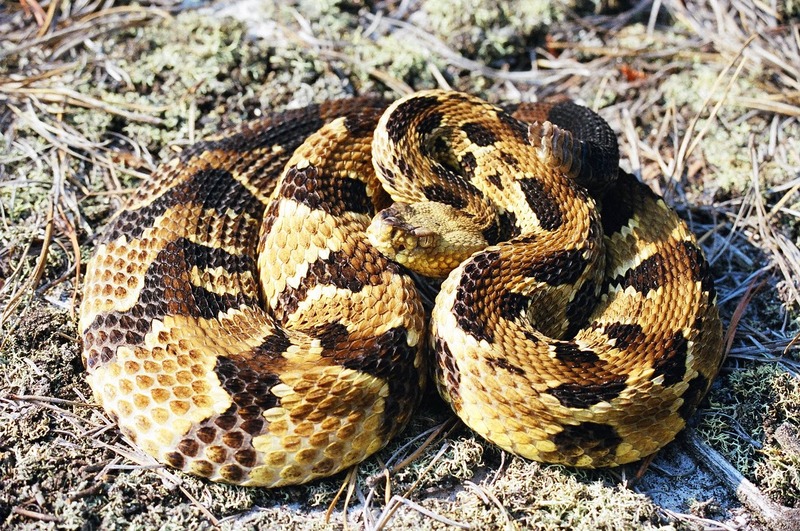 You can easily find and differentiate the rattlesnake from other species. It has a strong body, with cross-bands of a dark color, brown or sometimes even black. The stripes are always present, but some distinctive male rattlesnakes have a completely black color, and rumors say those are the most dangerous exemplars. The rattlesnake can also be differentiated by its tale, as it has a rattle at the top. Usually, those snakes will not rattle if they are not provoked. The majority of snakes would rattle instantly when danger is detected, but the rattlesnake uses this gift to attract the eventual prey, but also to announce dangers around them. Fortunately, the rattlesnake can hardly be found in urban areas, and even the small isolated homes scares them. you can find this snake in the forests, especially in the rocky areas around rivers. The snake likes to bathe in the sun on the south facing slopes, hunting for squirrels that are their favorite food. The rattlesnake can stand still for hours waiting for the prey, and its color is helpful to deceive the small mammals. 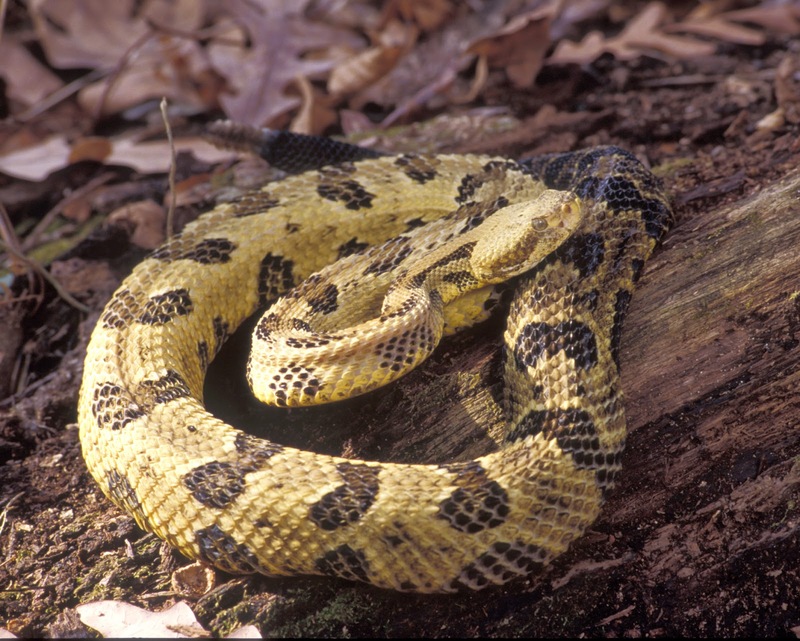 However, it is the most feared snake in Kentucky, and even if attacks on humans were not signaled often, the rattlesnake has the capacity to fight you. It is a fierce predator, but a non aggressive specie unless provoked. The rattlesnake has a color resembling with the environment, and this is why they are hard to detect, and the majority of humans that reported being attacked by a rattlesnake stepped on it accidentally. However, even this case is rare, as the rattlesnake is able to detect motion and sounds, so they will hide in case somebody gets close. The females will have their first babies at the age of 5 years old. The babies are born alive during the fall. The rattlesnake lives more than the other snakes, an a healthy male could live up to 25 years. however, the population of rattlesnakes in the world is threatened, and Kentucky remains one of the fewest places in the world where the rattlesnake is not an endangered species. The rattlesnake is a venomous snake, and one of the most dangerous species if attacked. It belongs to the vipers family, a family that has two pit openings located on the sides of the head. Those pits are the most important weapons of the venomous snakes, as they are effective in lowering and stopping the vital functions of the warm blooded animals. The venomous snakes, including the rattlesnake can be easily recognized by its vertical pupils, as all the other harmless snakes in Kentucky have horizontal eyes. Of course, the rattle at the end of the tail is also a characteristic, and you should be careful when you hear that sound around you in the middle of the forest.